The first rope tow in America was rigged here at Suicide Six Ski Resort in 1934. Now this classic ski hill continues the tradition of classic skiing and kinship, with a new $1.5 million quad for 2016-17 winter season. 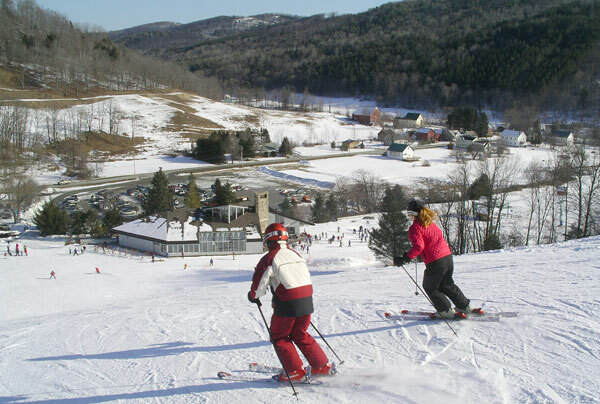 This is a great hill for skiing with your family, less busy than Killington nearby, homey and fun. Owned by The Woodstock Inn, your winter holiday experience includes gracious lodging at the 4-diamond Woodstock Inn, skiing off the base to summit quad on well-pitched slopes at Suicide Six, just a short drive from downtown Woodstock, and touring miles of scenic cross-country trails at the Woodstock inn Nordic Center. For après ski, there’s a spa, kids activities, and a big fireplace that dates back to the Rockefeller era here in the delightful town of Woodstock. The Woodstock Inn offers ski and stay packages. And there’s covered bridges leading to the historic hamlet of Woodstock to shop and explore where the wealthy Rockefeller family settled for their family retreats in winter and summer in the beautiful Green Mountains.